I will start by saying that I hope everyone had a WONDERFUL CHRISTMAS! Both of my kids really enjoyed Christmas this year! My 3 year old thoroughly enjoyed it! She is just now old enough to really understand and have a fun time! So lots of memories and fun times were made! I have taken the term “Christmas Break” quite literally this year. I usually try to cram as much stuff into my breaks as possible! But, not this year! I have really just hung out with the kiddos! I have done a little cleaning and organizing, but not much considering that I have been off for about 10 days now. So, now I have hit panic mode…with only a couple more days I have a list of things to do! Has anyone else done the same thing?!?! I have a couple of projects that I want to post! But I need to go snap a few pics. first! So, what HAVE I been up to lately?!?! I have had a few free minutes to whip up some fun and crafty stuff! Just not a lot of time to blog about them. (I need someone to just transcribe for me!) I have TONS of blog post swimming around in my head! I whipped up two Christmas outfits for my daughter and my niece. They turned out super cute! 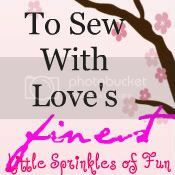 I saw this awesome tutorial on how to sew in a reverse applique on a shirt. I followed it to make a cute candy cane shirt to match the ruffled pants. This is a really awesome tutorial and oh so easy!!! LOVED IT!